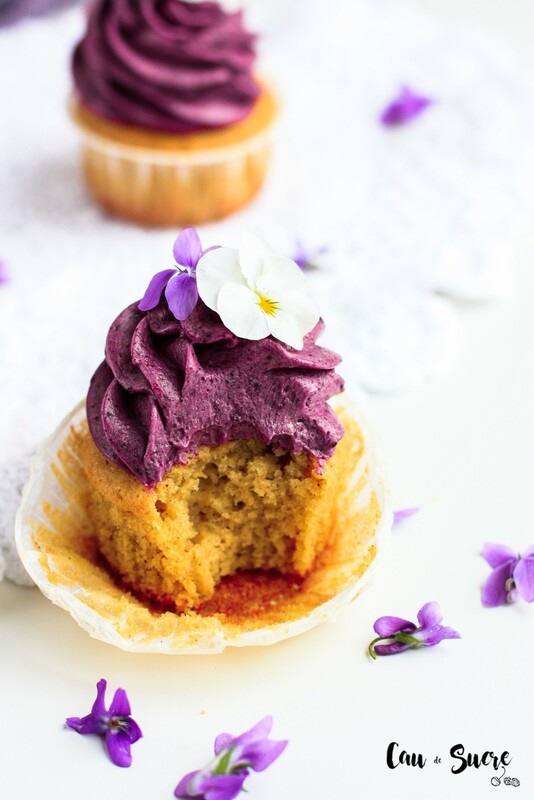 Spongy vanilla almond cupcakes made with spelt flour and frosted with a vanilla pudding buttercream, violet aroma and blueberries. How are you feeling? More than one drooling, right? 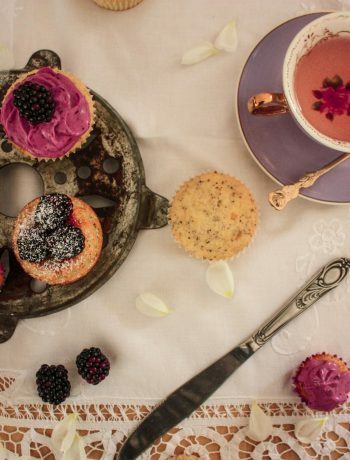 I can assure you that these cupcakes are not only pretty, but they also delicious. Are you curious? Then keep reading!! 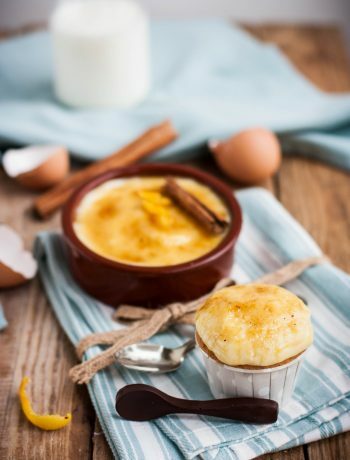 I am glad to welcome you to the May’s recipes special recipe in Cau de Sucre. 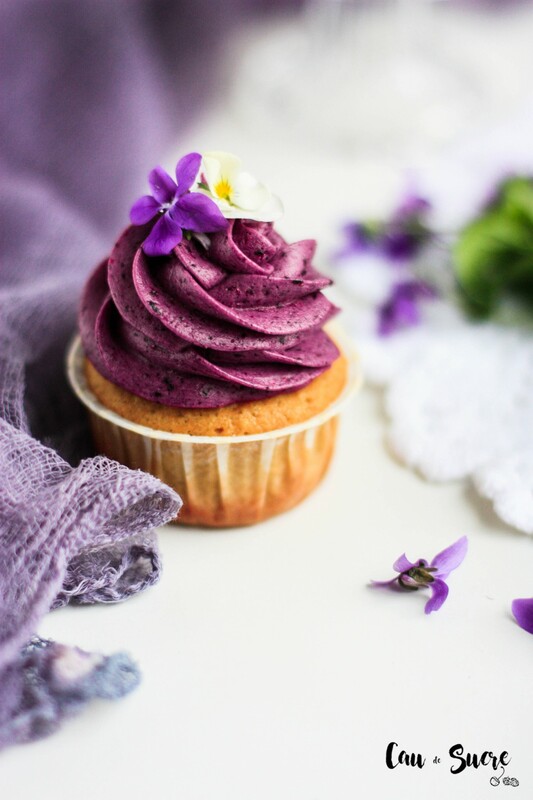 And this special is about: purple recipes. 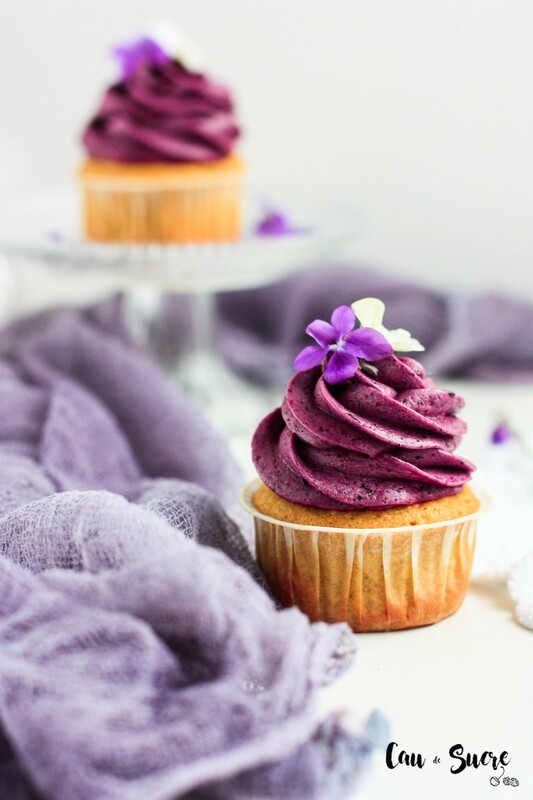 And I inaugurate it with these spectacular cupcakes, with that buttercream of the most intense purple colour I’ve ever seen. And not only that, with a main ingredient of the most curious and unknown; The violets, those delicate and beautiful wildflowers that I love! And you will be asking yourself, why purple in particular? Well, I bet you already smell that it’s my favourite colour. Red also calls me a lot, but I have a little obsession with purple, violet, etc. That everybody who knows me already know. So, I thought about creating a special month with recipes where the purple is the key colour. I already have the recipes planned and I can tell you that the ingredients are a little monotonous, so I must apologize for the lack of variety. You know that, of the nature, few are the fruits that result in that colour when they are processed. Now yes, what I have tried is that they are different recipes and there is something suitable for everyone. 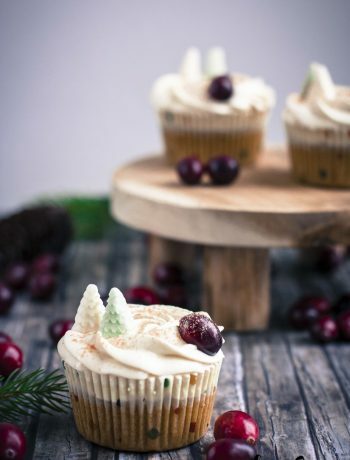 The recipe for these cupcakes is from my great admired Carolin Strothe from the blog “Frau Herzblut“. I have commented on many occasions how much I admire Linda Lomelino and for me, she is surely the best Blogger and bakery photographer. But if there is anyone who can be at her level, she is, in my opinion, Carolin. Just check he blog and tell me, it’s in German, but only with the photos you’re going to enjoy it for sure, she’s an artist! 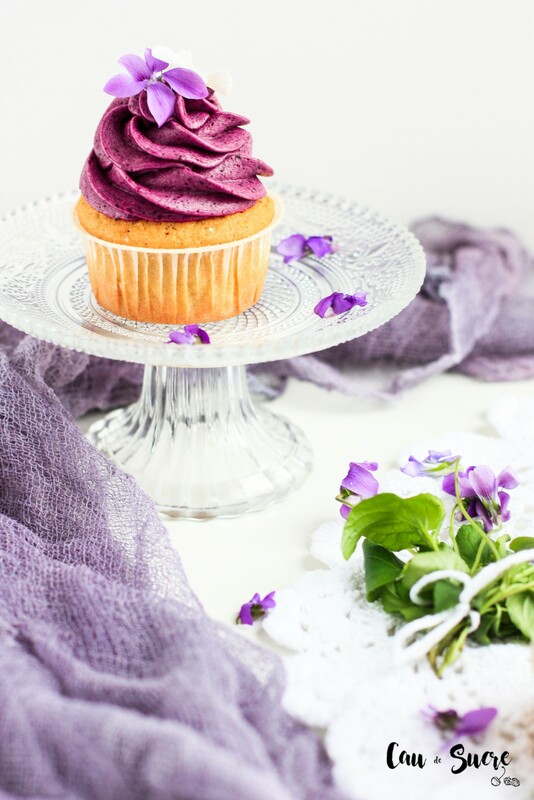 In addition, almost all their recipes have a common point, ingredients or decoration in purple tones!! If she does not mind, I’ve adapted a few of her recipes for my “Purple May” special. And something you’ll also find in these recipes are healthy, ecological and alternative ingredients. 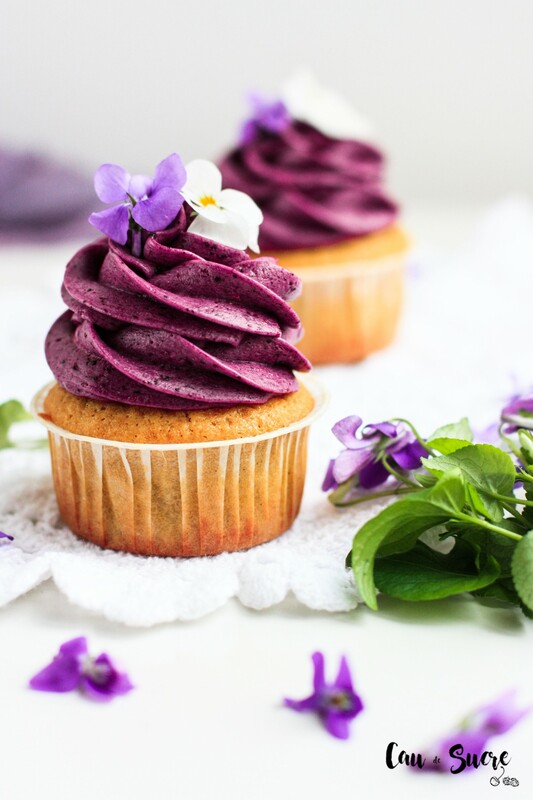 As, for example, in these cupcakes spelt flour, which I have never used before and which gives very good results and is a good substitute for all purpose wheat flour, since it is easier to digest, provides fewer calories and has a high Protein content. Raciones:: 12 cupcakes	Tiempo de Preparación:: 45 min. Total: 1h 10min. Preheat the oven to 170ºC. Prepare the cupcakes pan with 12 paper cups. In a bowl, beat the butter and sugar until creamy. Incorporate the eggs, one at a time, beating until it is integrated before adding the next one. Add milk and vanilla extract. In another bowl, sift the flour with the baking powder and salt and incorporate the almond flour. Pour dry ingredients into the wet mixture and mix just until the ingredients have been integrated, for about 30 seconds. Distribute the batter evenly into the cups, filling only up to ¾ parts of its capacity. Bake for about 22 minutes or until, when punching a cupcake with a toothpick, it comes out dry. Remove from the oven and let cool on a rack. Mix 50 ml of the pure blueberry juice with the pudding powder by mixing until dissolved. Put the rest of the juice in a saucepan with the violets extract and sugar. Pour the powder and juice mixture and heat over medium heat by mixing continuously until it boils and thickens. It should be a lot thicker than a normal pudding. Cool the pudding completely covered to skin with a transparent film so that it does not crust. When the pudding has cooled completely, pass it through a strainer to make it thinner. In the bowl of the mixer, beat the butter until creamy. Add the pudding in several additions and beat for about 2 minutes at medium-high speed until the buttercream is fluffy. Fill a pastry bag with buttercream and use tip that you like to frost each cupcake. Refrigerate the cupcakes for 1 hour for the buttercream to harden a little. 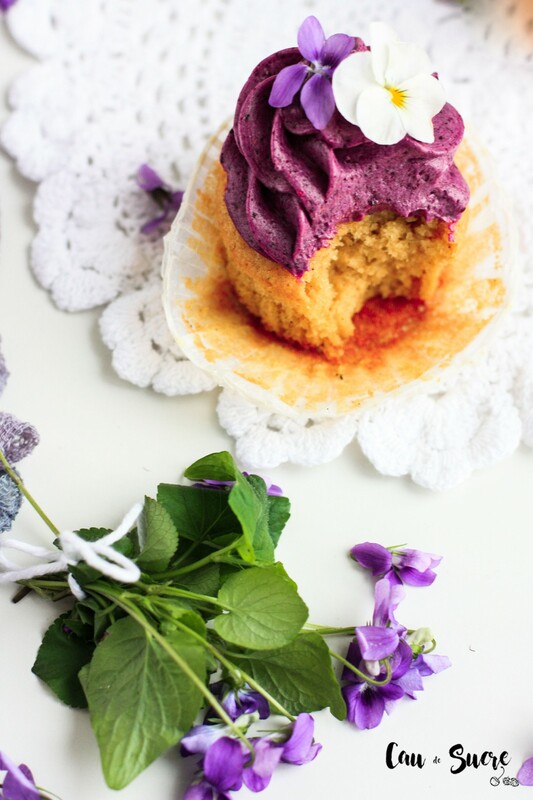 If you have, just before serving, decorate the cupcakes with violets or fresh violas. 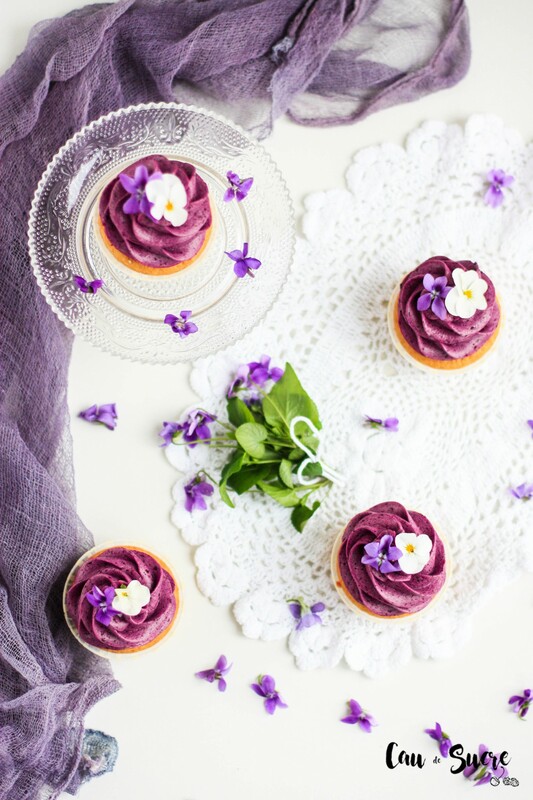 If you do not find pure blueberry juice, you cannot substitute it for regular juice, but you can prepare it by cooking 200 g of fresh or frozen blueberries with 100 ml of water in a saucepan. When it comes to boil, cook it for about 5 minutes and then pass the mixture through a strainer. You will need 200 ml of this mixture for the recipe.